Saddle Up for the Cattle Drive! This ain't your average, everyday Euro game! Welcome to the Great Western Trail, where players take on the role of cattle drivers attempting to wrangle their herd to market. The trail will be tough, and countless hazards await you. Can you make it to the end of your journey and turn a tidy profit? Find out in Great Western Trail. 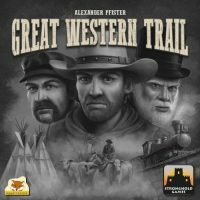 In Great Western Trail, you are rival cattlemen in 19th century America, herding cattle in a circular trail from the south of Texas to Houston, where your cattle are then shipped by train, earning you money and victory points. Hire capable staff, such as cowboys to improve your herd, craftsmen to build your cattle posts, or engineers for the railroad line. Add a Review for "Great Western Trail"